Bridge cranes are a vital part to any construction job involving the building, repair, transfer, or even demolition of bridges. Bridge cranes are capable of lifting pieces of bridges as well as their vital support beams, and can also work in conjunction with lift and transfer cranes to help move pieces from one location to the next. 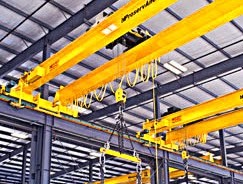 But as the case is with other pieces of large machinery, overhead bridge cranes must be treated and operated with care, inspected regularly, and maintained properly in order to ensure safety for all employees who work with or in close proximity to them. There is little room for error when you're engaging with a very large, very heavy, and very strong piece of equipment. Require all employees who will be operating the bridge cranes to take part in qualified educational training courses. Conduct daily inspections. Ensure that your cranes are ready to go each day by setting aside 15 to 30 minutes for interior and exterior inspections. Address any concerns promptly. Even the most minute of repairs should not be put off until later, since a small issue can quickly turn into a large issue.